The west of Scotland extends from Wigtownshire in the south, along Scotland\'s intricate west coastline to Sutherland in the north. Basketwork ranges from agricultural in the south, to crofting and fishing baskets along the west coast northwards. Many baskets in regional collections today are from the Western Isles rather than the mainland. 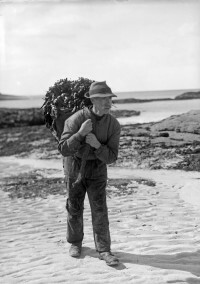 East coast fishing became increasingly dominant in the second half of the 19th century, as well as the dominance of Lowland style fishing over small scale crofting-fishing further north, which may be why there are also far fewer fishing related baskets in much of this region.